Abdul Qader Al Rais received his bachelor’s degree from the United Arab Emirates University in Al Ain. His work has been exhibited widely throughout the UAE and abroad, including the Czech Republic, Germany, Lebanon, and Oman. During his career, Al Rais has received several prestigious awards – such as the Al Owais Award for Studies and Scientific Innovation – and was the first recipient of the Sheikh Khalifa Prize for Art and Literature. His work resides in the collections of the British Museum, Mathaf: Arab Museum of Modern Art in Doha, Kuwait Museum of Modern Art, Sharjah Art Museum, and the Jordan National Gallery of Fine Arts. Al Rais is also a founding member of the Emirates Fine Arts Society and the Emirates Plastic Arts Society. He currently works and resides in Dubai. 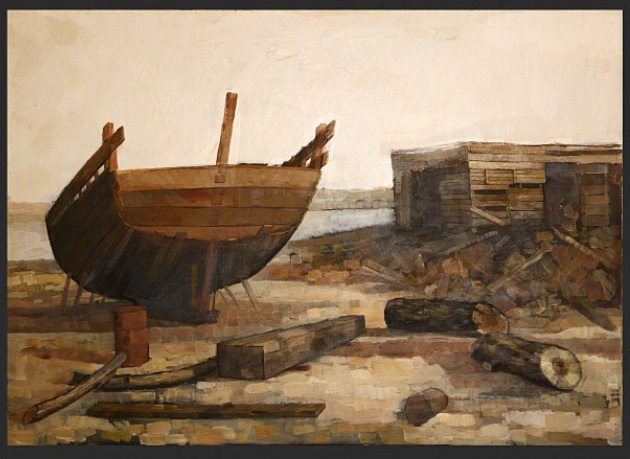 One of the UAE’s most critically acclaimed artists, Abdul Qader Al Rais uses a photorealistic style to paint landscapes and architectural scenes inspired by traditional Emirati neighborhoods, buildings, and forts. He also creates nonrepresentational paintings that incorporate abstracted calligraphy and his signature motif, floating squares. In the mid-1980s, Al Rais sojourned in the United States and was so inspired by American landscapes that he began painting his homeland with renewed vigor. One of his more recent watercolors, Thekrayat, which means “memories” in Arabic, refers to the artist’s recollections of the importance of the land to Emiratis. The painting depicts the rural outskirts of Fujairah, the only emirate without a coastline along the Arabian Gulf.